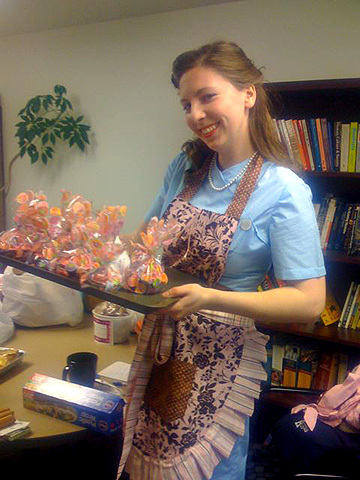 March 23, 2009 | The Women and Gender Studies club had a retro bake sale at the TSC patio before spring break to promote Tuesday's "Reinventing Barbie Bash." Fearing that selling baked goods for a feminist cause would have been seen as sexist, the organizers dressed as June Cleaver, the homemaker from the 1950s television program Leave It to Beaver, to point out the sale's absurd nature. "The hardest part was wearing heels all day," said Katie Reeves, who co-organized the sale with fellow student Katie Matekovic and Dr. Brenda Cooper. The event raked in more than $335 and featured goods prepared by faculty, such as the "Double-A Cupcakes" by Farol Nelson and "Male/Female" cookies by Dr. Fran Titchener -- the male cookies had nuts. The Barbie Bash invited students to submit America's favorite doll in an altered state to challenge gender stereotypes and societal norms. The dolls can be seen in the bottom of the Merril Cazier Library or at the Women and Gender Studies club's Web site. The winner of the People's Choice Doll will be announced during the Barbie Bash from 3 to 5 p.m. Tuesday in the Merrill Cazier Library.